The Food Bank of Western Massachusetts has announced that the Food Bank Farm will be no more. The reasons are more complicated than "it was a tough couple of years for the harvest" because this farm is unlike the others in the area or the country. Food Bank Farm worked like a typical CSA in that shareholder dollars shelled out at the beginning of the season paid for the operation of the farm. The difference with Food Bank Farm is that food was grown not only for shareholders but for the Food Bank of Western Mass. to distribute to agencies—200,000 pounds this year. In a deal struck with Michael Docter back in 1991, the Food Bank, located in Hatfield, bought a 32-acre farm in Hadley. Docter could farm it and realize his dream of providing fresh produce to the hungry but it was up to him to pay all expenses, including the lease. The money would come from shareholder dollars. This unique model has been operating for almost 20 years. In Hadley, Docter has been a fixture, driving all manner of farm machinery on Bay Road. Docter farmed organically—not an easy feat back in the day when UMass Extension was just beginning research on pesticide farming. There was some organic farming going on but not on a large scale. For traditional potato and tomato farmers, no spraying meant vulnerability to blight and unpredictable weather. But Docter managed to pull it off. The farm's roster of crops included corn, many kinds of greens, melons, garlic, and root vegetables, along with experimental crops. A bakery produced cookies, pies and corn muffins made from the corn grown on the farm and when the place was in full swing, hens and roosters dotted the barnyard, a sea of red poppies could be plucked and lunch was being cooked up outside under a little tent. Food Bank Farm was so popular that no one ever left. An added element of bliss was the interns, a tanned subculture of laborers, many of whom trained under Docter. Rob Lynch and Meaghan Arquin started Riverland Farm after working at Food Bank Farm. "There was a lot of coupling going on that summer," said Arquin. "I think there were at least four who got married." The last time I visited the farm, it was late in the season. The flowers were mowed down and the only crops left were rows and rows of kale. As I drove in and pulled around a lake-sized puddle in the parking lot, a cat came across my path with a dead mouse in its jaws. Farm life as usual. Inside, things were not as usual. In the barn, Docter was in his usual element surrounded by potatoes, five kinds of apples and a group of shareholders. He looked like a man being held up by a posse of natives in the Garden of Eden. "Can't we just write some letters?" inquired one person. Docter said he was sorry but it was truly the end. His eyes were red. Someone else asked if there was anything they could do. "No," he replied. "It was final, a mutual decision…" He shook his head and looked down. At the register up front, Sherrie, who has been with the Farm since its inception, munched on an organic chocolate chip oatmeal cookie. "It's a combination of things," she said as she rang people up and commiserated. "Some of this land has to lie fallow for a while…." After farming at the pace Docter was farming, it could be that more than just the land needs to lie fallow. Two years ago, Docter asked former intern Ben Perrault to take over as farm manager of the Food Bank Farm. Perrault and his wife Liz own Mountain View Farm in Easthampton across the river. While Ben and Liz handled the farming, Docter managed the Food Bank Farm store. Typically a farm will sell some products from local vendors of eggs, milk, pickles, cheese. The Food Bank Farm store, on the other hand, offered local grass-fed beef, cheese, dairy, eggs and other items at prices that would put Whole Foods to shame. Wild-caught bluefish, Atlantic cod and responsibly farmed salmon were for sale, as were chickens from small producers at the Crazy Eddie price of $1.99 a pound for thighs. In two decades, Docter went from hunger maverick to organic farmer to uber grocer. It was a sweet ride for Food Bank Farm shareholders while it lasted. Now they are being given the choice to stay with Docter and join his new CSA or hook up with Mountain View and pick up their food in Easthampton. Last year Docter and his wife purchased some property abutting the Food Bank and have hired Ray Young, another former intern, to run a new CSA. Docter says he is scared to be starting from scratch on his own but is more concerned about shareholders. "Things change, and yes, to everything there is a season," he said. "I just feel bad about this community we created." He looked at the people milling around the barn and said, "Oh, well, I guess we just move the community up the road." The name of his new CSA is Next Barn Over. Food Bank of Western Mass will continue to support the growing of food for the hungry, but now the farming will be done by the Perraults on their farm and on a part of the former Food Bank Farm in Hadley. Some CSAs have shares available for summer, 2010 and some have waiting lists. In addition, there are winter shares available; root vegetables and in some cases greens and garlic can be picked up once a month until late December, or, in the case of Red Fire Farm, there is a Deep Winter share that runs from January to March. Some farms (Red Fire and Kitchen Garden) bring shares to select locations for easier pickup. The latest entry in the CSA lineup is Swartz Family Farm, with pesticide-free hydroponic veggies and fruit. They are an online retailer with a year-round growing season. For a complete list of CSAs in the region, visit the Valley Locavore blog at http://www.ValleyLocavore.com. Gleaning is an ancient tradition practiced by hunger activists, scavengers, gypsies and, in the case of Jessica Harwood, practically minded citizens. Originally it was an idea from the Old Testament that food left from the harvest should be taken by the poor. Harwood got the gleaning bug when working on a farm in Vermont. Cooperating with Rachel's Table in Springfield, Harwood has been organizing school groups and various volunteers to come out and glean at area farms. Those responding to the call (you rarely know when it is going to come) race out to the fields with gloves, boxes and a desire to get perfectly good food into the right hands. Because food is sometimes not fit for shipping or a crop is overly productive, or if a field just has to be picked before being seeded, the gleaners are called in. Harwood's team of gleaners operates under the moniker of the nationwide Helping Harvest. 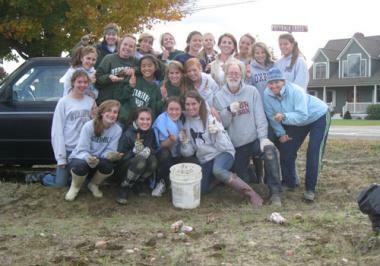 For the most part school groups go out to farms with her to glean. Pictured here is the junior varsity soccer team at Deerfield Academy. They skipped practice to help out at Riverland Farm, where carrots were surviving the freeze but needed a home. Like other gleaned veggies and fruit, the food was brought to pantries and survival centers in the area. More information can be found at http://www.gleaningprojectwma.com.